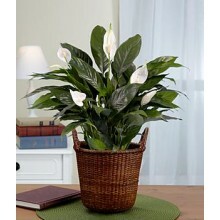 Peaceful, calm and elegant, this dish garden including a peace lily plant will add serenity to any room. Note: Pot design may vary Metro Manila Delivery: Please place your order at least 2 days prior delivery date. Provincial Delivery: Please place your order at least 3 days prior delivery date. 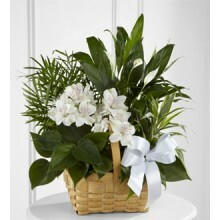 Offer unspoken words of comfort, hope and peace Planter is simply enriched by a white ribbon bow bearing words of "comfort". Dark green leaves offer a calm background for the white candle-like blooms of this easy to care for plant. Note: Pot design may vary Metro Manila Delivery: Please place your order at least 2 days prior delivery date. Provincial Delivery: Please place your order at least 3 days prior delivery date. 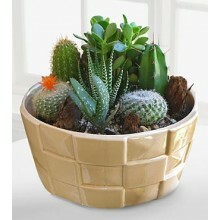 Our modern interpretation of the cactus garden is a clean, simple addition to any space. The drought tolerant, easy to care redwood bark accents. Note: Pot design may vary Metro Manila Delivery: Please place your order at least 2 days prior delivery date. Provincial Delivery: Please place your order at least 3 days prior delivery date. 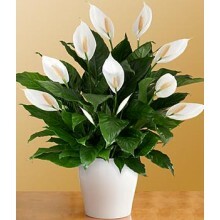 Our deluxe peace lily is the perfect gift, even for those that do not have a green thumb. This handsome plant has white sail-like flowers that stand out between the shiny, dark green paddle-shaped leaves. 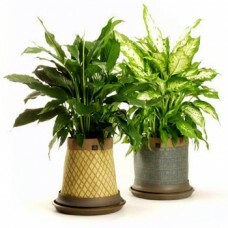 The Spathiphyllum is a natural air purifier and does well indoors even in areas with little light. Care instructions are included. Note : Pot design may vary. Metro Manila Delivery: Please place your order at least 2 days prior delivery date. Provincial Delivery: Please place your order at least 3 days prior delivery date. Modern, lush and unique. This succulent garden can transform even an urban living space into a lush botanical sanctuary. It is the perfect gift for someone who appreciates something a little out of the ordinary and enjoys a low maintenance plant. 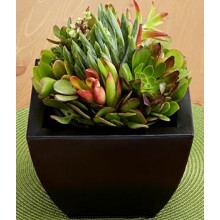 An array of multi-colored succulents are planted for a truly eye catching gift. Note: Pot design may vary Metro Manila Delivery: Please place your order at least 2 days prior delivery date. Provincial Delivery: Please place your order at least 3 days prior delivery date. 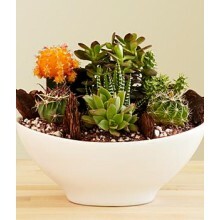 The Desert Daydreams Cactus Dish Garden is an unforgettable way to send your warmest wishes to friends and family to celebrate any of life's special occasions! A beautiful collection of cacti in a variety of shapes and textures are artfully situated together to create an incredible display intended to bring a splash of life and color to any setting. this dish garden will be a wonderful way to express your thanks and gratitude, send your get well wishes, or to celebrate a housewarming or new job. Note : Pot design may vary. Metro Manila Delivery: Please place your order at least 2 days prior delivery date. Provincial Delivery: Please place your order at least 3 days prior delivery date. Red and yellow kalanchoe, pothos, and ivy plants Basket design may vary Metro Manila Delivery: Please place your order at least 2 days prior delivery date. Provincial Delivery: Please place your order at least 3 days prior delivery date. Cooking is more rewarding when the ingredients are fresh from your garden. this Gourmet Herb Garden will not take up much space if grown indoors. 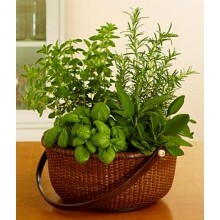 There is also the option to grow the plants outdoors, but no matter where you do, you can always use it in the kitchen! Note: Basket design may vary Metro Manila Delivery: Please place your order at least 2 days prior delivery date. Provincial Delivery: Please place your order at least 3 days prior delivery date. 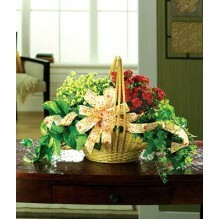 Send this bountiful green garden as a wonderful way to express your good thoughts and wishes for anyone special. 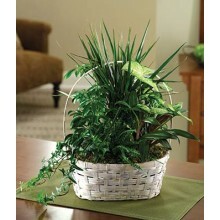 Lush green plants including dracaena marginata, fern, ivy, nepthytis and more, make up this fresh arrangement expertly set in a lovely handled basket. Arrangement measures Note: Basket design may vary Metro Manila Delivery: Please place your order at least 2 days prior delivery date. Provincial Delivery: Please place your order at least 3 days prior delivery date. 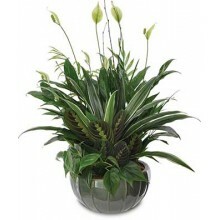 This potted lily is a traditional gifting plant that's easy to care for and looks wonderful in any environment. Its glossy, dark green leaves and long white flag-like flowers flourish indoors and can last for even those who do not have a green thumb. Care instructions are included. Note: Basket design may vary Metro Manila Delivery: Please place your order at least 2 days prior delivery date. Provincial Delivery: Please place your order at least 3 days prior delivery date. 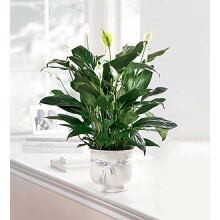 The Spathiphyllum plant with dark green shiny leaves and white flowers is the perfect compliment to any home or office. 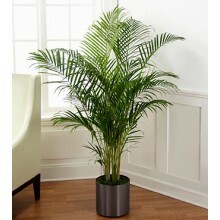 A large variety of other green plants is also available. Note: Basket design may vary Metro Manila Delivery: Please place your order at least 2 days prior delivery date. Provincial Delivery: Please place your order at least 3 days prior delivery date. Easy to care for yet breathtaking, this Mini Oasis is the definition of low maintenance. 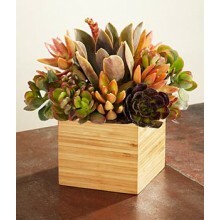 Place this bamboo box with assorted succulents on a desk at work, on a windowsill or as a centerpiece. Note: Box design may vary Metro Manila Delivery: Please place your order at least 2 days prior delivery date. Provincial Delivery: Please place your order at least 3 days prior delivery date. 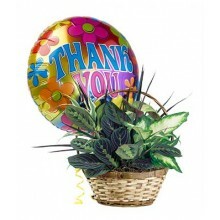 Express your heartfelt gratitude perfectly, and for any reason at all, with our beautiful selection of favorite foliage plants set in a decorative planter, topped with a Thank You balloon. Note: Basket design may vary Metro Manila Delivery: Please place your order at least 2 days prior delivery date. Provincial Delivery: Please place your order at least 3 days prior delivery date. Known for their attractive splayed green leaves, Note: Pot design may vary Metro Manila Delivery: Please place your order at least 2 days prior delivery date. Provincial Delivery: Please place your order at least 3 days prior delivery date.